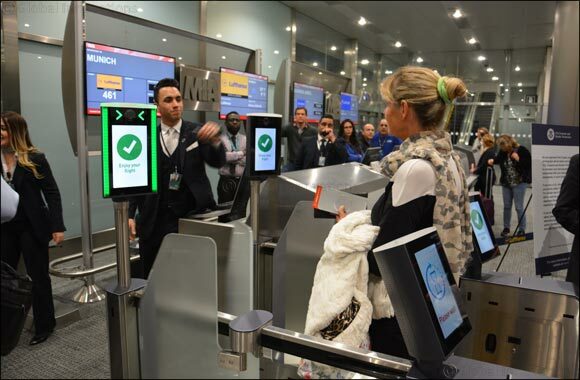 Dubai, UAE – 4 February 2019 – Passengers departing from Miami International Airport to Munich on Lufthansa flight 461 can now board with the quick click of a camera instead of a boarding pass and passport, thanks to the airport's launch of biometric exit technology last week. Through a partnership between MIA, Lufthansa, U.S. Customs and Border Protection (CBP) and global air transport IT provider SITA, a simple photograph taken at Lufthansa's boarding gate is used to confirm passengers' identities and their authorization to travel. The facial recognition verification process takes less than two seconds with a 99-percent matching rate, according to CBP. MIA expects to launch biometric boarding with additional airlines this year. The launch of biometric exit at MIA follows the airport's February 2018 opening of America's first all-biometric entry facility at Concourse E, which screens all international arrivals via facial recognition. The facility, which has decreased processing times by as much as 80 percent for participating airlines, was chosen from among 80 nominations worldwide as the 2018 International Airport Review Award winner in the Passenger Experience and Seamless Travel category. SITA and MIA have already partnered on a number of innovative travel experience solutions, including Mobile Passport Control and MIA Airport Official, the airport's mobile app.